The greenhouse has been started in the front yard. It is only 6 X 8 but I think it will be perfect for where it is located. I have a larger hoop house that is down by the garden area. It took about half the day just to get the landscape timbers that I'm using for the foundation level and plumb. 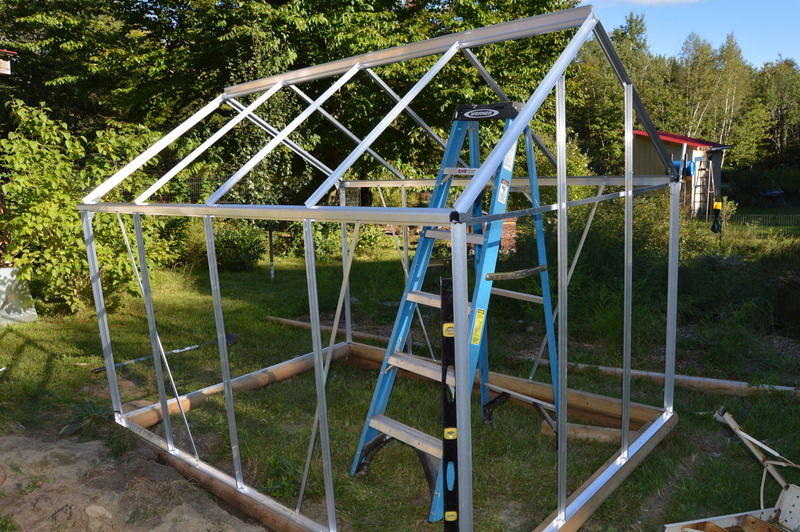 That was all I had the gumption for since it was in the 80s and the greenhouse is on the south side of the house in the sun. I put up the frame the next day when it was perfectly beautiful and only in the 70s. Since I'm putting the structure on a slope it took a little digging to get things level. You can see where I dug the upper slope into the ground. On the lower slope I actually stacked the timbers two deep to get things level. 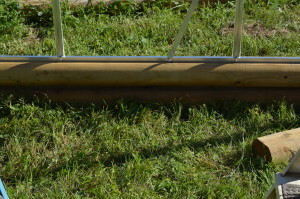 The ends currently are only one timber each which leaves a gap on the down side. My plan is to fill in those gaps with the fill that will be dug out of the inside space in order to put some good growing soil and compost in. The outside will be backfilled also so that all the gaps and open areas will be closed it. 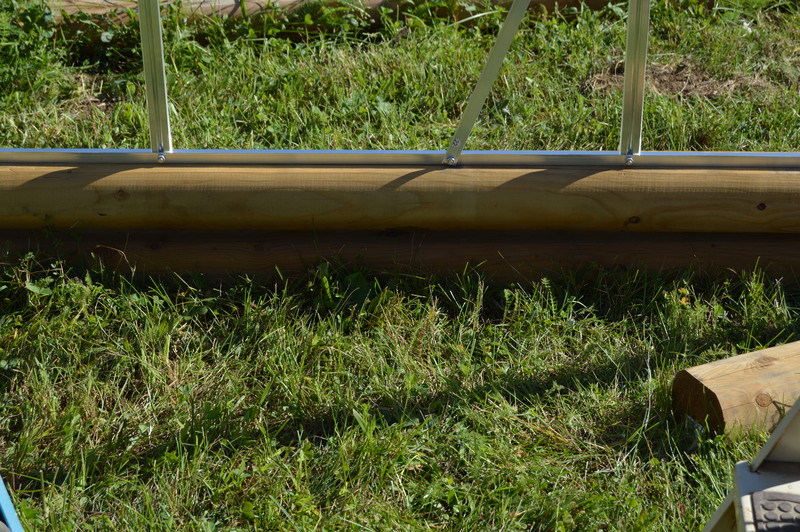 I did chose to use pressure treated landscape timbers. I know there is controversy over whether to use these when you are going to grow food inside. I feel the risk is minimal since arsenic is no longer used as part of the treatment and where this directly on the ground I really need the benefits of the pressure treatment. After reading the instructions, yes I did it first, I knew it was going to be a bit of a challenge to get the roof structure up since it said you needed the assistance of two other people and my sweet husband was at work. Well I can be fairly creative when needed so the ladder that you see in the picture became my helper. I was able to lay the ridge piece across the top of the tall ladder while I used a step stool to reach the joints to get them bolted together. It actually worked really well. The next step it to put together the door and the vent windows that are part of the roof. I am hopeful that I can get the entire thing completed in the next week or so then I can get some fall greens planted. I need to go through my seeds and see what I have on hand that might do well in the cool of the fall in Maine. I cut notches in the corners of the timbers so they would fit well together and overlap then I screwed them together. Double stacked on the down side of the slope. 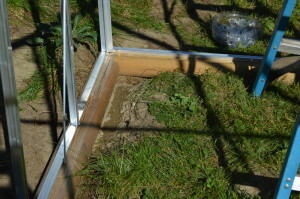 The frame of the greenhouse is screwed into the timbers with 3 inch screws.